In Singapore, medical devices are overseen by the Health Sciences Authority (HSA). Classification of devices is similar to the system in Europe, but there are some differences. Prior approval in a reference market such as Australia, Canada, Europe, Japan, or the United States may significantly reduce the review times of your devices. Download the chart for more details. Medical Devices in Singapore are governed by the Health Sciences Authority (HSA). 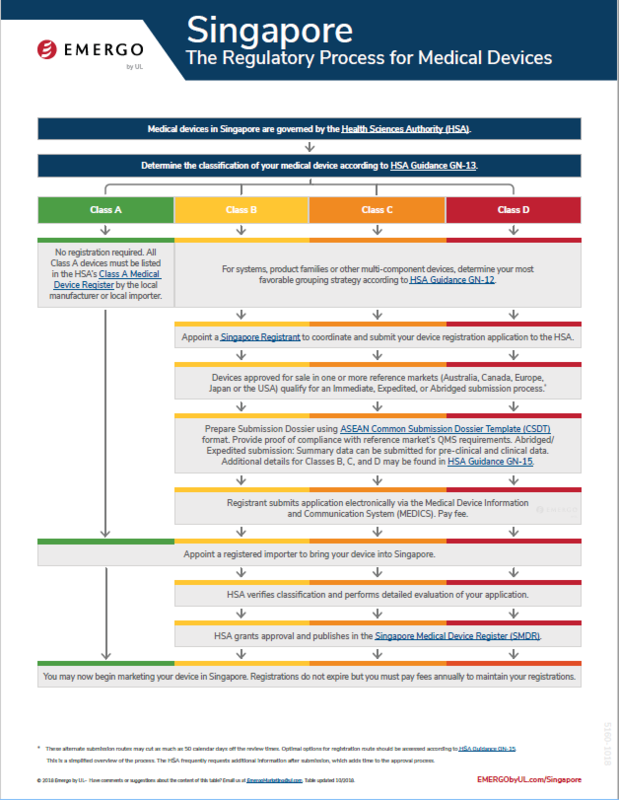 Determine the classification of your medical device according to HSA Guidance GN-13. Class A products which are non-sterile do not have any registration requirements, and may skip directly to Importation. For Class A sterile devices, and Classes B, C, and D, follow the steps below. For systems, product families or other multi-component devices, determine your most favorable grouping strategy according to HSA Guidance GN-12. Appoint a Singapore Registrant to coordinate and submit your device registration application to the HSA. For classes B, C and D, if your device has been approved for sale in one or more reference markets (Australia, Canada, the Europe, Japan or the USA) qualify for an Abridged, Expedited, or Immediate (Class B only) submission process.*. Prepare Submission Dossier using ASEAN Common Submission Dossier Template (CSDT) format. Provide proof of compliance with reference market’s QMS requirements. Abridged/Expedited submission: Summary data can be submitted for pre-clinical and clinical data. Additional details for Classes B, C, and D may be found in HSA Guidance GN-15. Registrant submits application electronically via the Medical Device Information and Communication System (MEDICS). Pay fee. Appoint a registered importer to bring your device into Singapore. For Class A Sterile devices, HSA verifies classification. For Classes B, C, and D devices, HSA verifies classification and performs detailed evaluation of your application. You may now begin marketing your device in Singapore. Registrations do not expire but you must pay fees annually to maintain your registrations. This is a simplified overview of the process. The HSA frequently requests additional information after submission, which adds time to the approval process. * These alternate submission routes may cut as much as 50 calendar days off the review times. Qualifications vary: Immediate registration is available for Class B devices with approval in two reference markets and sold for three years without any safety issues. Abridged review is available for devices with approval in one reference market. Qualifications for Expedited review vary by device class: Class B and C devices require either approval in two reference markets OR one reference market and a three-year track record without safety incidents. Expedited review of Class D devices requires prior approval in two reference markets.